Bronchitis is inflammation of the air passages (bronchi) of the lungs. It can make breathing difficult and sometimes painful. Acute Bronchitis—sudden onset of symptoms. This lasts only a short time and there is full recovery of lung function. 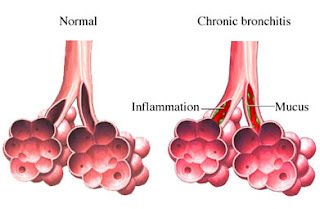 Chronic Bronchitis—long-term inflammation, obstruction, and degeneration of the bronchi. This is often the result of many years of cigarette smoking. This is a serious medical condition, also called chronic obstructive pulmonary disease . Asthmatic Bronchitis—intermittent inflammation of the airways in people with underlying asthma . This is most commonly associated with allergies or environmental irritants. Symptoms depend on the type of bronchitis. In most cases, antibiotics are not necessary because the infection is viral, not bacterial. Antihistamines are usually not recommended, because they tend to dry up secretions, which can make the cough worse. • Stop smoking or never start. • Avoid exposure to respiratory irritants. • Avoid contact with people who have bronchitis.